In their meteoric rise in the early 19th century, banks did not advertise their services. Rather, they attracted clients, investors, and businessmen via a very visible display of their stability, wealth, and economic prowess: big, beautiful buildings. As men of cloths (cotton, linen, and textiles were huge money-producing industries in the British Isles) superseded men of the cloth, and a market economy supplanted the church as the driving force of the nation’s ethos, banks flaunted their status by building increasingly grand headquarters and branches with opulent décor. The construction of lavish bank chambers from the 1840s through around the end of the 19th century constituted one of the largest building campaigns ever in Scottish cities. These are my favorites. Upon my arrival for the first time in Scotland, a sleek tram transported me from the airport in Edinburgh to the center of the city. 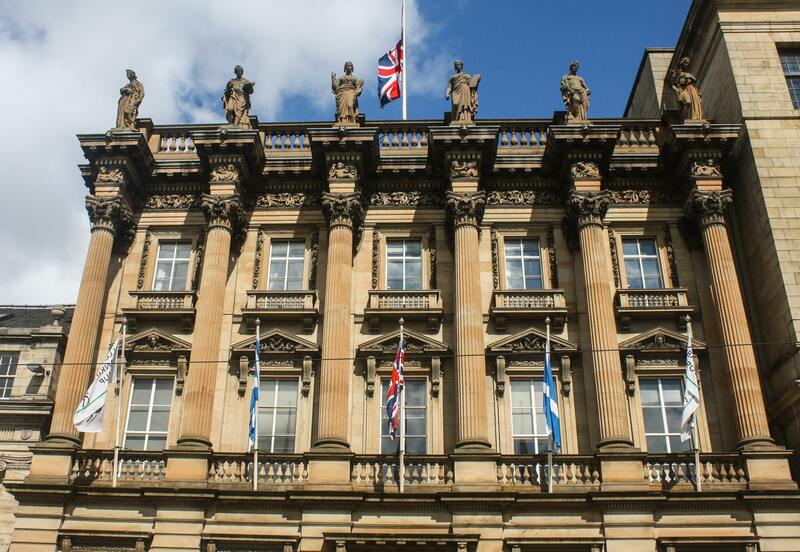 Upon stepping out of the tram, I took in the early-morning quiet of St. Andrew Square. But when the tram moved along to its next stop, the building across the street revealed itself in all its grandeur. This impressive structure was constructed in 1846 as the headquarters of the British Linen Bank, the only British bank to be formed on the basis of an industrial charter. British Linen lasted until 1969, when it was acquired by Bank of Scotland, which subsequently merged with Halifax Building Society. Despite the changes, the edifice remains the same, and it was my very first indication that buildings in Scotland were meant to last. 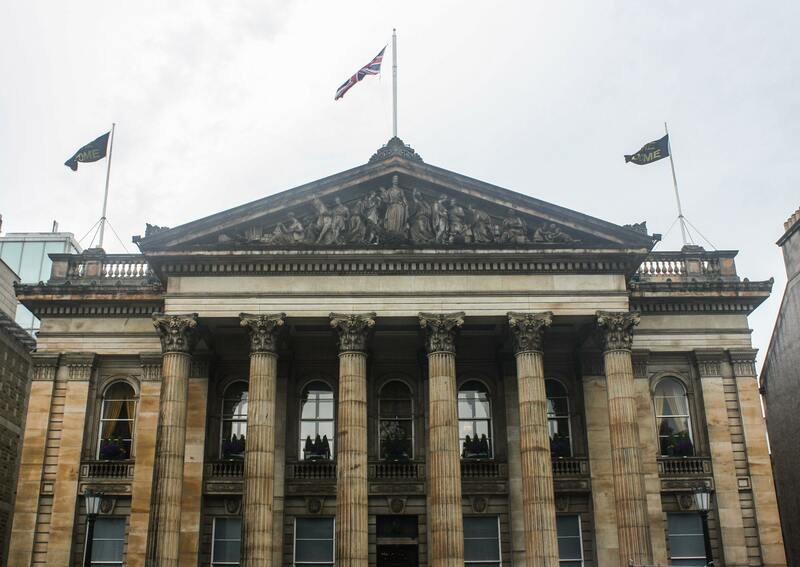 Designed by prolific Scottish architect David Bryce, the building looks like it came straight out of the Roman Empire. Six towering Corinthian columns dominate the sumptuous façade of cream sandstone ashlar (now bearing an orange hue after a good scrubbing). A shallow balustrade balcony runs along the second floor, repeated as balconettes on the third floor and again along the roofline. Sculptural pediments cap the windows on the second floor, while garlands run down the sides of those on the third. My favorite component was the half dozen larger-than-life-size statues standing atop the entablature above each column. The statues, by Scottish sculptor Alexander Handyside Ritchie, represent navigation, commerce, manufacture, science, art, and agriculture. But if you look very closely, you’ll spy, under each of those statues, a smaller cherub reflecting the field represented by the statue: The navigation cherub, for instance, holds a trident, while the agriculture cherub clutches a scythe. Along George Street, one of the main, and most handsome, thoroughfares in Edinburgh’s New Town, the old Commercial Bank of Scotland building rose as the bank’s headquarters in 1847. Just like Edinburgh’s British Linen Bank Building, six soaring Corinthian columns, standing tall at 35 feet, grace this bank’s façade, also of cream sandstone ashlar (and also tinted a slight orange from its cleaning). Large lions’ heads can be found above the ground-floor windows, with smaller ones running around the cornice. The columns support a 95-foot-wide pediment, filled with a fantastic display of allegorical sculpture. Amid boats, parcels, and an anchor, a female figure dangles a sextant in her hand, symbolizing navigation. Another female figure and a child hold a cornucopia, spilling fruit (representing plenty) at the feet of a female figure representing Scotland. A trio of robed men amid as many packages stands for merchandise, while three children with a cog portray science. 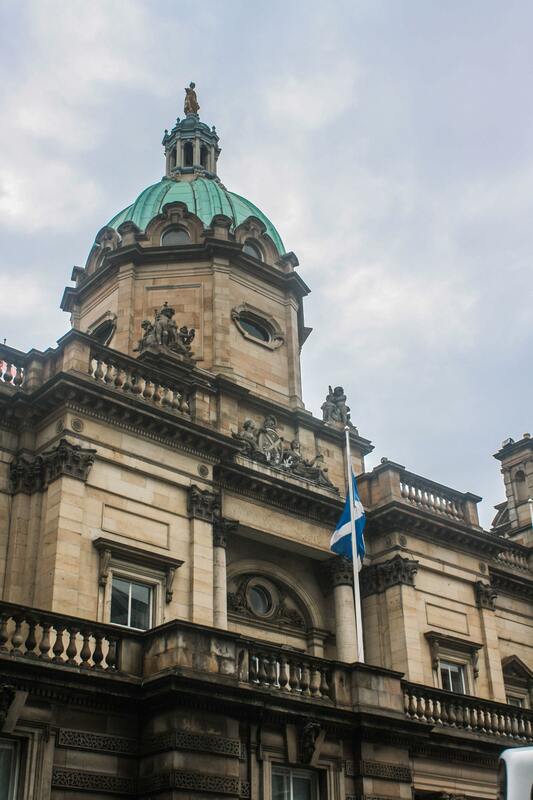 Through a series of mergers, the Commercial Bank of Scotland became the Royal Bank of Scotland, which, in 1993, decided that the building was no longer viable and put it up for sale. Fortunately, it wasn’t razed, and all you have to do to see the grandeur of the interior, with its columns, central dome of glass, stained-glass windows, and coat of arms in a mosaic on the floor, is pop inside for a drink, a meal, or a spot of tea—the building now functions as a bar and restaurant called The Dome. Walking along Princes Street, with its sweeping and unobstructed view of Edinburgh’s Old Town, is one of the greatest urban views in the world. And one of the key components of that wonderfully old skyline is the old head office of the Bank of Scotland, originally built as a Georgian-style villa in 1806 atop the Mound, a manmade hill created from earth excavated for the New Town on a site that had been a rubbish dump. The danger of slippage necessitated a formidable retaining wall that still exists. 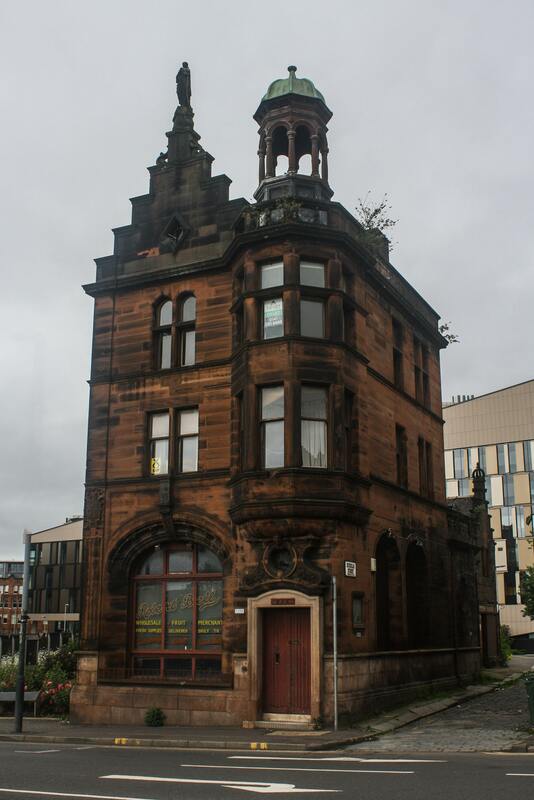 With the bank’s business booming, an expansion was necessary—a perfect time to also address complaints that the building looked stark and ugly from Princes Street. Architect David Bryce was tapped for the job, and his redesign, completed in 1878, is what still exists today. Bryce altered the existing building by adding a single-story extension along the front with alternating bands of rusticated stone as well east and west wings crowned by domes, one topped by a statue of Prosperity (with an urn and grapes) and the other by Plenty (grasping a sheaf of corn); replacing the original saucer dome with a much taller dome topped by a statue of Victory holding a laurel wreath; and encasing the entire building in a Roman Baroque façade. Up close, this formidable structure has some very fine details, such as the lozenge-shaped windows in the octagonal drum of the dome; columns, caryatids, and keystone heads; and the figures of Justice (holding her scales) and Plenty (with her cornucopia of money) flanking the bank’s coat of arms (granted in 1701)—a saltire cross with four bezants, heraldic representations of coins. Other statue groups of putti personify Agriculture, Commerce, Mechanics, and Navigation—all critical to the bank’s success—and Britannia and her children. In the heart of the irresistible city of Inverness, the gorgeous old Caledonian Bank building stands as a perfect entry to the pedestrian shopping strip that begins at its doorstep. 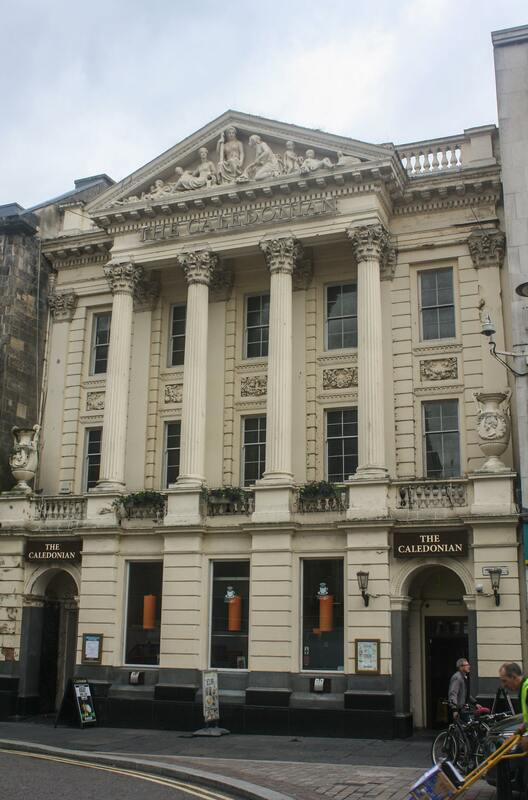 Erected in 1848, it remained the head office of Caledonian Bank until 1907, when it became part of the Bank of Scotland, which moved out in 2003 (today, the building houses a pub). Bearing a striking resemblance to a Greek temple, the three-story building features two ground-floor arched entrances below a balustraded balcony (mirrored on the roofline) hung with flowerboxes. At each end is an enormous urn, one displaying a medallion with Queen Victoria’s profile, the other with Prince Albert’s. Panels with decorative swags separate the windows on the second and third floors, the central one containing a couple of amoretti. The highlight and most prominent features are the four tapered, fluted Corinthian columns and the richly carved tympanum by Alexander Handyside Ritchie. Central among the allegorical figures is Caledonia, who is flanked by female figures representing the River Ness, with an urn spilling water, and Plenty, spilling the contents of her cornucopia. I particularly liked the little sheep at the extreme right, in a nod to Scotland’s rural interests. This little, narrow building lacks the grandeur of the previous four, yet it still captivated me, despite its forlorn condition and its less-than-worthy surroundings: an abandoned lot next to it, the rough cobblestone street alongside it, and a parking lot across the street. Resting on a polished pink granite foundation, the three-story red-sandstone building with Edwardian Renaissance details was completed in 1895. Now listed “at risk,” it’s definitely showing its decaying state, with decades of soot on its façade, some graffiti, wild vegetation growing on the roof, and the sign for the long-abandoned fruit market that once occupied the ground floor hanging on. Nevertheless, it’s still easy to see what a charmer it was. The arch above the main ground-floor window sports a series of little putti. The four-windowed corbelled oriel presents a lovely corner on the upper two stories, while a leaded oculus features handsomely above the door. The stepped gable at the roof is punctured with a diamond window and is topped by a female statue. Next to it rises an ogee-domed wooden tempietto. The rear of the building sports an oval window, another gable, and a rounded balustrade. A bronze plaque records the site as the home of poet Thomas Campbell, and there’s a lovely coat of arms on the front of the building. There’s good reason to be sanguine about this structure’s instauration: The flats have been rented, and a nonprofit is working with a conservation specialist to rescue it from completely falling apart.